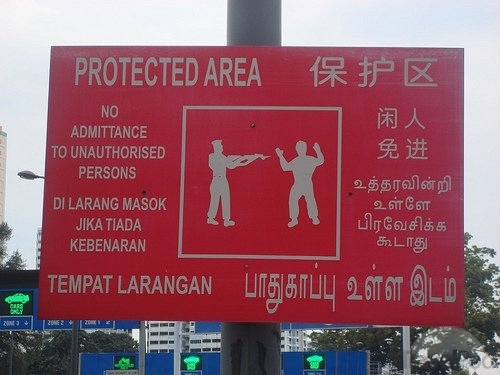 Any person who is in unlawful possession of any arm or ammunition shall be guilty of an offence and shall on conviction be punished with imprisonment for a term of not less than five years and not more than ten years, and shall also be punished with caning with not less than six strokes. We got them out of Laos. We got them into Thailand. We got them out of Thailand. We got them into Malaysia. We got them out of Malaysia. We got caught in Singapore. I remember sitting in a hotel in Malacca wondering what to do with them. After 2 months, we’d grown quite attached to them. Little bits of metal jangling at the bottom of our backpacks. We knew we had to get rid of them. 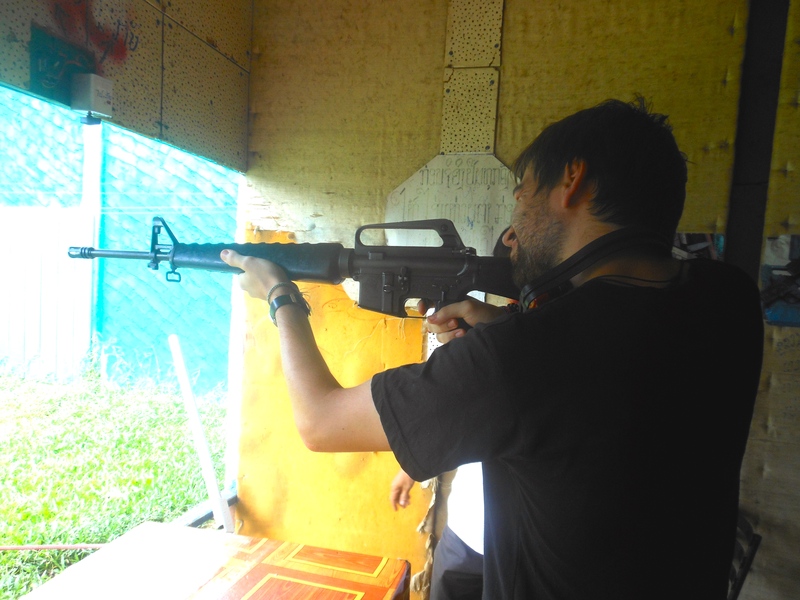 You see, the shooting range in Laos was the first time me and Dave had ever fired guns before, being British and all that. 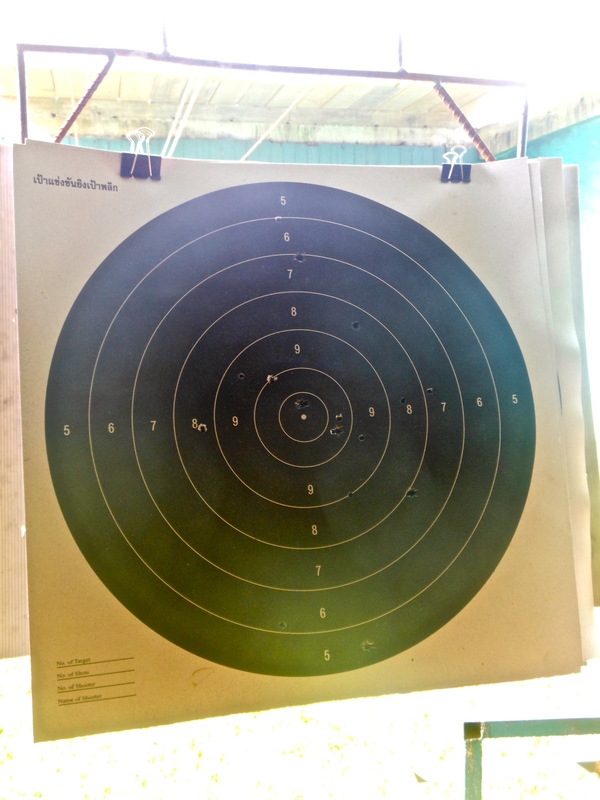 It was exhilarating and we were surprisingly good. It can’t be Call of Duty, because my record is about 3 kills / 1,827 deaths in 3 years of playing. It was also very loud. The Magnum was impossible to control, while the M16 made you feel like an elite soldier. I think we were always meant to keep the bullets, seeing as the casings happened to fly into our bags inadvertently when shooting. That’s when we first realised we smuggled them out of Laos and into Thailand – when we were rummaging for passports at the guesthouse in Chiang Mai. Awkward. From then on it was largely forgotten about. They lay dormant at the bottom of our bags – like the One Ring in the Shire – until Malacca, the sleepy city in southern Malaysia. Remembering about them, they got pulled out and inspected, before the thought occurred to us – is it illegal to carry used bullets from country to country? 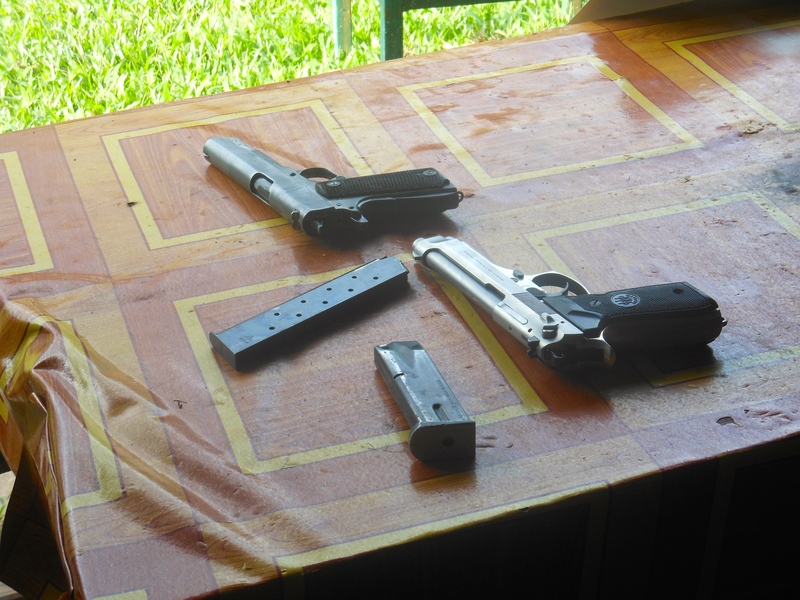 We looked it up but found nothing about no used ammunition – just no ammunition. Gut instinct said it probably was – and it later turned out to be true – but we took the risk and kept them anyway. Conveniently enough, the alarm bells started ringing when we tried to leave Malaysia. We got our passports stamped at the border and went to collect our bags from the scanners, although there were no actual border staff behind the computers. When we arrived, we couldn’t see our bags and a queue was forming. We shuffled to the front and saw our bags inside the actual scanner, with the conveyor belt not moving. Unsure what to do next, we looked around for some staff – were they watching from another room? The queue kept building. Climbing inside the scanner, we pulled our bags out and quickly moved on, trying to look calm. Didn’t dare look behind us – if a security guard was going to grab us, we’d feign surprise and ignorance. 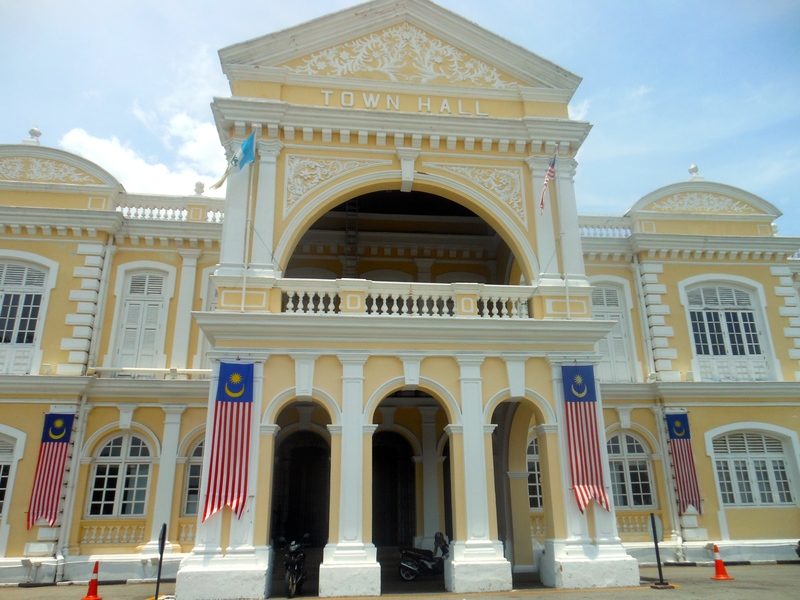 Wandering past a Malaysian Town Hall with ammunition in our bags… ho hum. We got across the border and reboarded the bus. A few minutes later, it was time for Singapore customs. Declaring nothing, we got our passports stamped and confirmed we had no chewing gum on us – an arrestable offence! We moved into separate queues and chucked our bags in. I walked through and picked mine up and tootled forwards a few yards before turning to check on D… wait, where was Dave? Oh phew, there he is. Hang on, who’s he with? A crowd of border police were surrounding him. I tried to reach him but was turned away by another of the border police. Unable to get back in, I ran through to the bus depot and found ours, telling the driver there was a tiny problem, and Dave would be with us in 5 minutes. Chuffed with the good news, I made my way back to the border exit to find Dave but was denied again by the police. I waited for 30 minutes and made a bit of a scene to attract the attention of the police again, so I could ask them how Dave was. They wouldn’t tell me anything, so I asked them if they killed him, just to gauge how mean they really were. Stuck with nothing to do, I went back to the bus to ask them to wait another five… it had gone. We travelled without phones, laptops or any gadgets apart from a couple of old iPods, so I went for a wander to try and find some public transport information. I also needed to get in touch with our friend Felix, who was going to meet us in Singapore at 7.30pm. It was 7.20pm and we were still stuck at the border. We planned to sleep on his floor as we couldn’t afford to stay anywhere and I didn’t have any way of contacting him. An hour passed as I sat glumly on my backpack, with no sight of Dave. I was genuinely worried – had he been deported? Taken to a police station? Put in jail? With no way of contacting each other, I figured I’d stay another hour before trying to find Felix, wherever the hell he lived in Singapore, and ring the British embassy. And then a glorious moment happened – Dave appeared. He grinned sheepishly as he filled me in on what happened. Lots of officers, a thorough bag search, a lot of paperwork, a latex white gloved full body search… definitely no bullets hiding up his bum! The officers weren’t happy that Dave had hidden the bullets inside his hip-flask, but he told me he mustered his best British accent to wave away these concerns. After the border control and police reached a joint decision that Dave wasn’t, in fact, a smuggler, he was let on his way with a slap on the wrist and a lot of paperwork. We boarded a public bus, unaware of its destination, and thrust a few Malaysian ringgits towards the driver, as we didn’t have any Singaporean dollars. Remarkably, he accepted them. After 20 minutes or so, we spotted a Metro station so jumped off the bus and made our way to the station Felix told us about. Despite being over 2 hours late, there was no mistaking the 6ft 5″ blonde hulk towering above the Singaporean locals. He was still there! We couldn’t believe our luck. Quick to apologise and explain, we let him know what happened. Having been with us on during the mistravelling tales of Cambodia, he wasn’t even surprised.